You will ride in comfort on the Showgirl, our 33’ Coldwater Sportfisher. It provides plenty of room to spread out with a complete walk around. The cabin is equipped with tons of comfortable seating for 7 and a cabin heater to keep warm on the chilly rainy days. The Showgirl comes with a privacy standup head, on board coffee and if seasickness hits you we have amenities stocked to ease your stomach. At an overall length of 38’ and a beam of over 10’ the Showgirl was built to weather the Alaska seas. The cabin provides full view all around to enjoy the Alaska scenery and wildlife with sliding windows all around. The Showgirl is stocked with custom made Sensi flex rods for Halibut and Salmon. These lightweight rods have a super sensitive tip to enable anglers to easily see subtle bites. Combined with Shimano 2 speed reels it is set up for the perfect fishing adventure. Providing world class fishing for Halibut, Salmon, Lingcod and more in the most magnificent setting in the world. Fish within mear miles of 26 thousand feet mountain peaks and even closer to the Hubbard Glacier. Grizzlies, Black Bear, Moose and Deer inhabit the surrounding lands as bald eagles soar all around you. Yakutat has a picturesque boat harbor with the St Elias Mountain Range looking down on it. Charter Captains have the luxury of close fishing spots within 30 min of the harbor in relatively shallow waters. Traveling out Monti Bay into Yakutat Bay where fishing can be 40 ft. to 300 ft.
A variety of species are available in Yakutat Bay to keep your day of fishing fun filled. The sport fisherman can expect the opportunity to catch halibut, rockfish, ling cod as well as all 5 species of Pacific Salmon being in Yakutat Bay within their season. 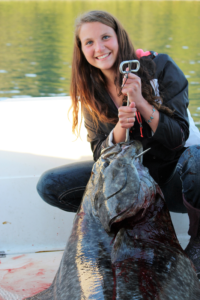 Average summertime halibut spots range 60-100 ft. producing on average 70 – 100 pound halibut. A sport fisherman won’t return to the harbor worn out and tired from deep water fishing but will return with tons of stories and the opportunity to fill some fish boxes.